It’s another picture perfect day here in Adelaide, South Australia. Despite the fact that Autumn has been with us a few weeks now I’m getting uncomfortably hot. I’m lying on my stomach on a small marina, my face hanging over the edge and inches from the water. As is the (annoying) habit of our cat I’ve simply dropped down and parked myself right in the walkway. Why? Getting out and looking for little beasties to photograph is a passion of mine. If I’ve managed to randomly bump into some caterpillar or spider I’ve never seen before, then I pretty much have to clear my diary. I am not a professional photographer by any stretch, but it’s getting out there and seeing these things that’s important. Whilst walking along the wharves in Port Adelaide the sight of thousands upon thousands of jellyfish in the water has me reaching for my cameras, which are always in my car. This swarm seems extremely out of place. I’ve already done a live stream on Periscope showing the good folks of Internet land this odd phenomenon, and now it’s time to really try and do it some justice. First off, these graceful creatures are Moon Jellies. They are extremely common in Australian waters. I have observed them now in the Port River in St Vincent’s Gulf, South Australia and in Darling Harbour, Sydney, New South Wales. Moon jellies are a favourite food for many turtle species. Being easy to both eat and catch I could understand why. I was actually asked this very question during my live stream. One thing that heartens me during these live streams (and that I notice while watching others) is that people really like animals. In fact, wildlife seems to bring people together in a very positive way. There’s some kind of take home message in this, don’t you think? Moon Jelly is the common name for Aurelia aurita, a species found globally. Jellyfish, along with sea pens, corals, anemones and hydra belong to the animal phylum Cnidaria. Approximately 10000 animal species belong in this group, and all are exclusively aquatic. Cnidaria are an extremely ancient group, with jellyfish fossils up to 500 million years old being discovered. Fossils believed to represent the Cnidarian crown group predate the Cambrian by around 200 million years. Cnidarians represent the oldest multi-organ animals known. 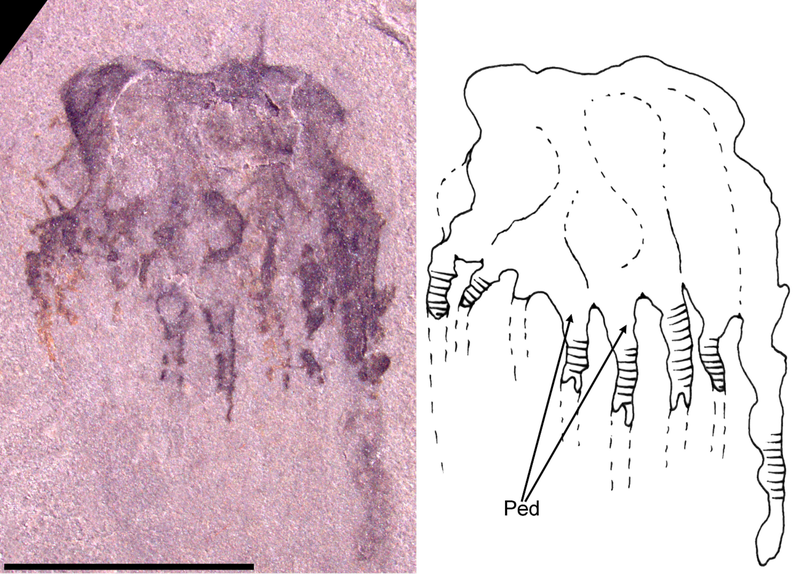 This fossilised jellyfish, found in Cambrian strata in Utah, is diagnostic of modern jellyfish spp. 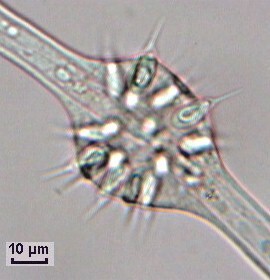 Image: PLOSone. The moon jellies, like all scyphozoans; or true jellyfish, posess cnidocytes. These are specialised barb like cells which on coming into contact with prey (or anything for that matter) penetrate and inject venom into the recipient. These particular jellies are almost harmless to humans. In fact, it’s said that the only way to feel a sting from a moon jelly is to kiss one. Big things come in small packages. 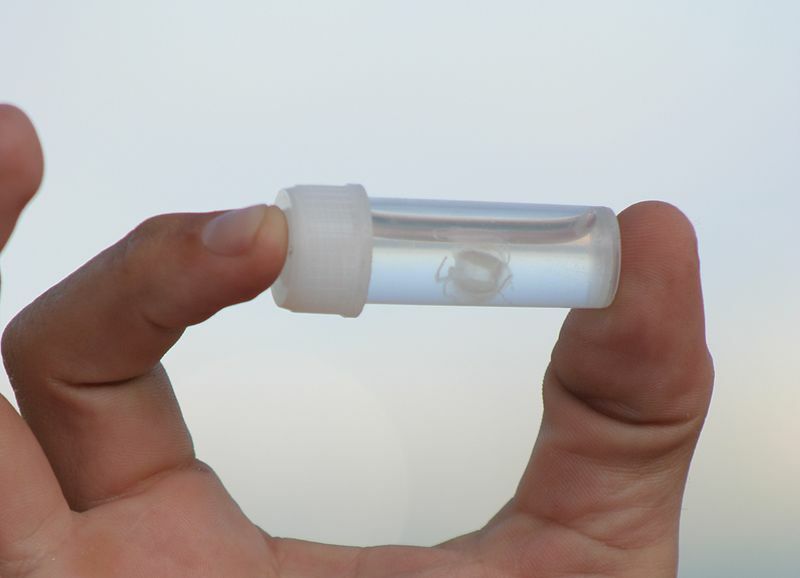 The Irukandji jellyfish delivers one of the most lethal venoms on the planet. Just when you thought it was safe….cue menacing music.. The moon jellies gathered here in the Port River are weak swimmers at best and so are often found collected in estuaries and inlets in this way, caught by the tide. Observing these jellies showed them seemingly moving as one: the group seemed to surge in one direction, oscillating back and forth in a manner reminiscent of group behaviours: much as flocks of birds appear to move about as one. Empirical observation would seem to bolster this. The bell structure of most jellies seemed to point in the direction movement. This is interesting. Jellyfish, along with other cnidarians, appear to have no (or at least very rudimentary) brains. They clearly have nothing we would recognise as a brain. Instead, their bodies are essentially a loosely interwoven collection of simple nerve networks, reacting and interacting with each other for the purposes of responding to stimuli. This decentralisation of “administrative duties”, or biological anarchy is seen in some rather more advanced creatures. Octopuses are one example. It is now well known that octopuses are extremely intelligent, but these amazing animals are now thought to sit somewhere outside the traditional brain/body divide we have accepted as a basic paradigm of our own physiology. Not only do octopuses have a brain, but their tentacles operate independently, acting with their own intelligence. Essentially the entire body of an octopus is it’s brain. Is this a feature of marine organisms and the result of marine existence? While jellyfish could hardly be called intelligent, are we not giving them enough credit? Does living in an environment as featureless and homogenous as the ocean necessitate a particular brand of spatial intelligence and information processing? Imagine a line representing a scale. This scale is that of intelligence: in particular the gradation from true brainlessness and pure instinct displayed by, say, bacteria to “higher” intelligence in which all memory, learning and response is coordinated by a complex central nervous system ( a brain. Think “human”). On this line an octopus seems to sit somewhere beyond halfway. Able to perform complex tasks, and armed with a unique “whole body” intelligence the octopus is gaining a whole new respect. The jellyfish appears to act wholly on pure instinct and autonomic response. I observe a swarm blindly clustering in a protected estuary and wonder. Decentralised nervous systems enable a different flavour of response to external stimuli. It speaks of a wholly different pathway by which intelligence could rise in the ocean. Terrestrial and marine environments could not be any more antithesis to each other. Land changes much more and over shorter periods of time than the sea. The land is a much harsher place in many ways. Organisms living on land have been forced over evolutionary time to undergo many more changes in order to survive: hard eggs, legs, and a much greater reliance on eyesight to name a few. Life in the ocean is vastly more stable. Does the existence of organisms such as horseshoe crabs, jellyfish, sponges and sharks, which have remained virtually unchanged for hundreds of millions of years give testament to this stability? 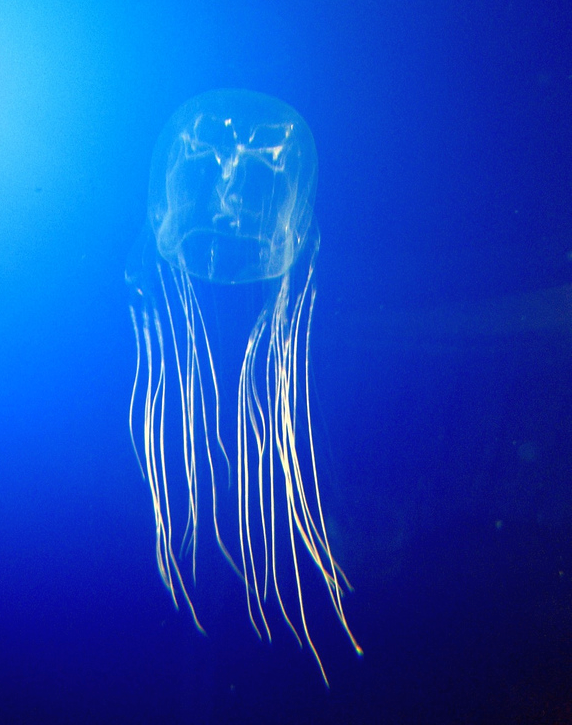 Where could a creature such as the jellyfish go, given time? The octopus, a simple mollusc, is an impressive example of a non human and quite alien intelligence. Do other forms of awareness and behaviour (that shown by jellyfish) constitute some new paradigm we haven’t recognised yet, and from which intelligence may someday emerge?